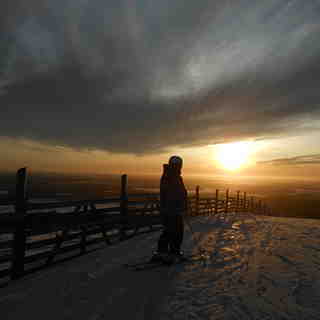 Is it snowing in Levi ?¡Gracias! 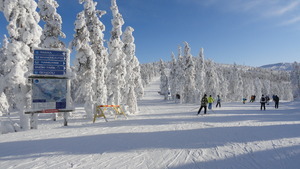 Levi is just 15 km north of Kittila which has charter flights from the UK making it an easy alternative to the Alps. 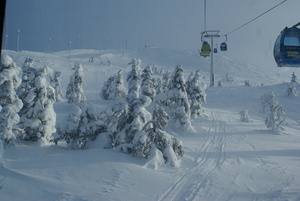 The mountains are not very high here, but Levi has a northern location that almost guarantees snow right down to the bottom of the mountain. The trade off for this is the cold and the dark. Some will love this at Levi, some won't but it is different! Don't despair, the sun does give off some light from mid-January that allows you to ski without floodlights from 10 am until 2 pm but most of the slopes are illuminated anyway. The Scanners are great boarders and have pumped a lot of cash into the development of new talent. Their terrain parks are some of the best in Europe and put many of the big Alpine resorts to shame! 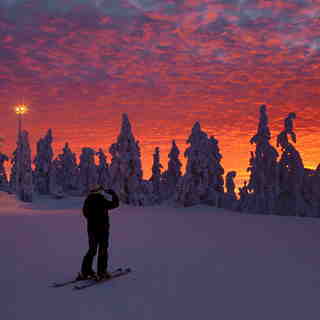 While up at Levi why not try some x-country skiing, or perhaps a reindeer sleigh ride! Off the slopes the town is purpose built but full of rustic charm. Prices are pretty high for most goods. We visited Levi in February 2018 during half term. We opted for a car to get us the 15 minutes or so from Kittila airport so we had complete independence. We also booked our flights and accommodation independently, too. Our family of 3 stayed in a log cabin close to the town centre (certainly within walking distance). It had accommodation for 6 or 7 split between a ground floor (a double) and a mezzanine floor above. The kitchen/dining room/living room was open plan with good heating as well as a log fire (which we didn't need to use during our trip). The kitchen was equipped well enough for us to cook at home (which we did some nights and on a couple of days we came back to the cabin and cooked up a pasta lunch instead of eating on the fell. We had two bathrooms with showers and one (the larger one) also had a sauna and boot dryer. Skiing on the fell was good, perfect for a beginner (our daughter) and just enough to keep my wife and I entertained but if we had been wishing to push it we could have skied it all within a day but that was not our approach. We wanted to do all we could there, not just ski and it was important to ensure that we gave our daughter the best possibility of learning to love skiing as we both do. We also took in a trip to the ice hotel (which would have been more limited had we not had use of our own hire car), went snowmobiling, went on a reindeer sleigh ride and our daughter also went on a riding hack with other experienced horse riders on Finnish ponies. 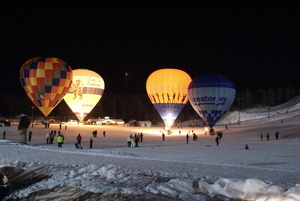 All these experiences were genuine and of great fun and were very accessible. Again, in a package holiday setting these might have been more limited (first come, first served basis) but the tourist information centre in Levi was great, they all worked very hard to provide us with the very best their region had to offer. Our final Lapland experience was husky sledding and this was a highlight. There are many great restaurants in the town centre and everything is in walking distance of the centre. Cuisine is available from many quarters: traditional Finnish fare, Asian, fusion, American and European. Some of the restaurants are of a very high quality. We didn't really get to involve ourselves in any 'aprés-ski' since we had our daughter with us but it seemed to be good and well-natured. We spent time in the spa or ten-pin bowling instead (responsible parents) :-). 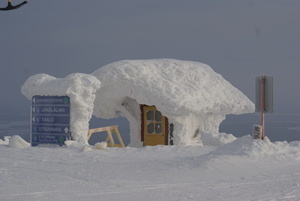 We found all the people in resort, whether it be waiting staff, ski instructors, tourist information staff, etc. to be friendly, approachable, helpful and polite. We could not really fault the whole experience. If you are looking for challenging runs and lots of mileage then perhaps this isn't for you, stick to Whistler, Park city, Zermatt or Verbier. but if you want to have a varied and very different experience to the Alps and are ok with a more relaxing kind of skiing then Levi is a great option. 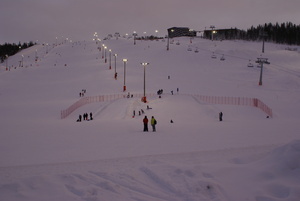 Oh, there's no queuing to get on lifts either and the hill stays open after dark with the bigger runs all being floodlit. Was there anything we missed...? We didn't get to see the Northern Lights...that was the only thing and that was because we had cloud cover all week but that meant it was -11 as opposed to -25!